“Up north” is a part of the vernacular of the mitten state. And for many who have lived in Michigan their whole lives, going up north means going to Traverse City or nearby areas. Perhaps one of the best known and loved destinations in the state, Traverse City feels like home to so many, even those who have only spent a week there, simply because of its modest, welcoming atmosphere. Whether you’re from Kansas or Kalkaska, once you visit Traverse City, you’ll be counting the days until you can return. Why Travel to Traverse City? When choosing destinations for your group or club’s next charter, put Traverse City in the mix. From entertainment like movies, concerts and festivals to sporting events to amazing food, wine, beer and spirits, it’s hard to find a town anywhere that can compete with what Traverse City has to offer. Here’s a look at some of the many ways Traverse City tops the list. Traverse City is awesome in every season, but for many, summertime holds the most memories. Whether in a cottage or hotel on East or West Grand Traverse Bay, or at one of the many inland lakes nearby, summer in Traverse City means taking off your pajamas, putting on your bathing suit (rather than your three-piece suit) and spending the day in, on and around the water. If you can float it, you can find it in Traverse City — from stand-up paddleboards to surfboards, kiteboards, kayaks, canoes, and jet skis — because watersports rule in Traverse City. To participate in this wet and wild fun, you need access to water. Fortunately, Traverse City area makes it easy with dozens of public beaches in town, as well as the beautiful Leelanau Peninsula (aka the little finger) and Interlochen. Between the Lake Michigan beaches, bays and the area’s surrounding lakes, there is so much variety it will be hard to choose your favorite. Another sport Traverse City is known for is golf, the three-season sport. Greater Traverse City has several championship golf courses designed by golf greats, like Arnold Palmer’s Manitou Passage and The Legend; Jack Nicklaus’s The Bear, host of the Michigan Open since 1985; Antrim Dells and A-Ga-Ming, designed by Jerry Matthews; Tom Weiskopf’s award-winning Cedar River course, named one of the best courses in northern Michigan by the readers of “Michigan Living”; and Gary Player’s The Wolverine. Other awesome area courses include Hawks Eye, Lochenheath, Elmbrook, The Crown, Pinecroft and Champion Hill. Compare them all and reserve your tee time soon. Traverse City has also become the go-to place for races and of all kinds. The fun begins in June with the Glen Arbor Solstice Half-Marathon and 5k run/walk around Big Glen Lake. Next is the Stars, Stripes & Splatter 5k at Grand Traverse Resort, dubbed “a color run that’s fit for the whole family.” Then, in July, it’s the National Cherry Festival “Festival of Races,” with a variety of races for every level. The Traverse City Triathlon on beautiful Old Mission Peninsula is in August. What’s more, beginning in 2019, the inaugural IRONMAN 70.3 Traverse City triathlon will also be held in August. 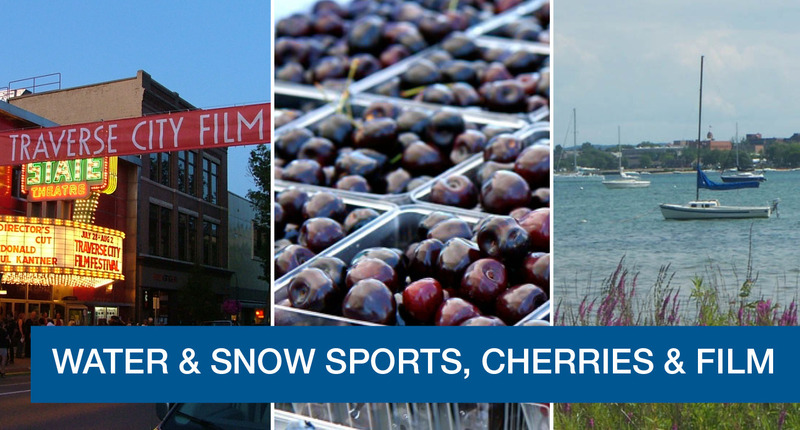 Perhaps the most famous of all Traverse City events is the National Cherry Festival, one of the largest festivals in the U.S., with more than 500,000 people attending every year. The Cherry Festival is held over the 4th of July, so visitors get their fill of fun, from concerts and great food to fireworks and midway rides. You can give cherry pit spitting a try, attend the Arts & Crafts Fair or the Old Town Classic Car Show, or take part in any of dozens of other activities planned. Due to its popularity, don’t wait to book your charter or your rooms; they fill up fast for this week. Another popular event is the Traverse City Film Festival, which is not quite Sundance, but certainly growing fast. Started in 2005, the festival features “rare, indie films and documentaries that often don’t make it to the popular ‘mega-plexes.’” With more than 100 movies screened at 10 different venues in and around downtown Traverse City, there is something for everyone, including free, family-friendly movies shown at Traverse City’s Open Space. The 2019 Traverse City Film Festival takes place on July 30-Aug. 4. This is another big-draw event, so the earlier you plan your trip, the better your chances of getting the accommodations you want. Winter doesn’t slow things down one bit in Traverse City, so you won’t want to miss the Bigfoot Snowshoe Race in January (a qualifier for the national championship race) and the exciting North American VASA, 10k, 27k, and 50k freestyle cross-country skiing race, held in the Pere Marquette State Forest in February. Both are huge community events, so expect a little partying and carrying-on to go along with the competition. In Traverse City, wine is popular year-round. With an events calendar that never ends, there are so many vineyards and wineries that fitting a visit in is easy. Wine connoisseurs can plan a whole tour like the one in our blog, “Explore Michigan’s Wineries.” You can make it a day trip or longer — it’s totally up to you. When you want to relax and just kick around town, there’s super shopping downtown, at the malls, and at The Village of Grand Traverse Commons, all of which also offer great eateries. The Traverse City area also boasts an abundance of artists and galleries in and around the city, enough that your group could easily plan an entire day touring them. And don’t forget the performing arts. Be sure to get tickets for concerts and events at Interlochen Center for the Arts, attend a concert of the Traverse Symphony Orchestra, or see a play at the Old Town Playhouse. Or maybe you’ll want to do all three. This overview barely scratches the surface of all there is to do in and around Traverse City, so no matter when you go, you won’t be disappointed. If you’re new to booking a charter bus and planning a group trip, download our “Complete Guide to Booking a Bus,” then start planning. Get even more great group trip ideas in our blog, "Your Dream Trip: Destinations in Michigan."